Today marks the exact halfway point of my three-year lease on my 2017 Chevrolet Bolt EV, and the report is positive. I’ve accumulated 13,920 miles and have seen consistent range of 200-plus miles through the whole 18 months. Most of the time it’s between 220 to 230 miles, even with the heat/AC turned on. Other than a couple of minor glitches in the entertainment system, which haven’t reappeared appeared lately, the car has been trouble- and service-free. It has never gone back to the dealer, although I’m supposed to get the tires rotated. What’s also been completely consistent is the silent, smooth trips I’ve taken, and the ability of the car to accommodate whatever I want to carry. That means an upright bass, two bass guitars, an amplifier, and multiple stands and cords for gigs with Fault Line Blues Band. I do not frequent places like the Home Depot or Costco, but if I did I’m sure I’d have no problem carting home loads of whatever I bought. I did run into a situation a couple of weeks ago where the Bolt’s 238 miles of range was insufficient. I needed to drive 300 miles (each way) to Arcata, California to attend the Humboldt Chamber Music Workshop at Humboldt State University. For a story on my happy week there, please see this story on Medium. What I recommend for anyone considering an EV is to think carefully about how often you need to take a trip of more than the range of your car. In my case it’s perhaps two, maybe three times a year. That means that I can still drive all-electrically nearly all the time and then just borrow or rent a hybrid or gas-powered vehicle for those rare times when it won’t do the job. It sure beats burning fuel all year long just so you can have one car that does everything. If you can’t do this, then a plug-in hybrid is still a reasonable choice. Just look for the most electric range you can get. The Bolt’s sibling, the Volt, does a fine job of enabling local driving with its 53-mile EPA battery range and carries an engine that kicks on when it’s needed to change the battery. That way, you’re free to go anywhere. The downside is that you still have an engine, radiator, oil, etc. to deal with like in an ordinary internal combustion engine (ICE) car. But driven mostly within the battery range, it’s essentially an electric car. In summing up, as I’ve stated before, the Bolt EV has filled my needs so perfectly and pleasantly that it has become “my car,” rather than an object of journalistic attention. I keep a notepad in the car but only use it to write down interesting music I hear on my SiriusXM channels and custom license plates I see that I think might amuse my wife. This is good news, because other than the range limitations mentioned above, and availability of a place to plug in at home or work, there’s no reason why you can’t live happily with an EV. Note: You may wonder why I haven’t posted a story here since April 16th. Other than my Bolt being completely familiar (nothing new to report) I have written seven stories on other vehicles and published them in the San Leandro Times, Tri-City Voice, and Clean Fleet Report. Please visit these sites if you want to read me regularly (All the EVs, hybrids, and alternative fuel cars end up on Clean Fleet Report). 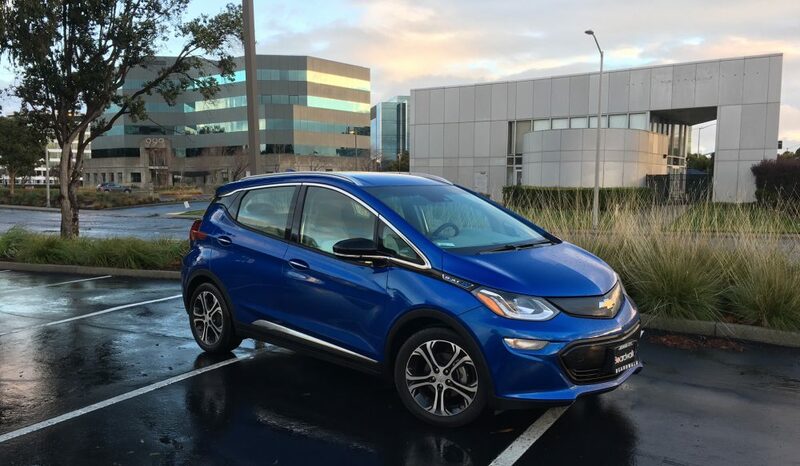 This entry was posted in cars, Chevrolet Bolt, Chevrolet Volt, Chevy Bolt, Electric car charging, Electric car range, electric cars, green cars, hybrid cars, hybrids, Uncategorized and tagged battery, Bolt EV, cars, Chevrolet Bolt, Chevrolet Volt, electric cars, electrics, EV Range, Ford EcoSport, hybrids, plug-ins by stevegoesgreen. Bookmark the permalink. Very succinctly addresses the critical element more people should consider, and is the reason why I suspect people are not really ‘addicted to SUVs’ so much as they’re addicted to one-size-fits-all solutions. Would love to discuss the work I’m doing in this area with you at some point. Just purchased a lease return 2015 Mercedes B class electric with 14K miles. Love it! Only about 120 miles max range, driving in e+ mode with a max charge. No DC charging but there is a $3K after market mod for DC charging. For longer trips I need a bathroom, lunch, etc. stop and plan for a location with a type 2 charger or I have a F-150 normally used for towing our travel trailer. In the first two months of EV ownership I have not had to use the F-150. What is your service interval that you have not been back to the dealer? The MB is every 10K miles or once a year for cabin filter, battery filter (free fo 100K), wipers and a general inspection. Hi, Nathan. Thanks for commenting, and I’m glad things are going well with the M-B. I test drove one briefly and liked it but wanted the range of the Bolt. I believe I’m OVERDUE to bring the car in for the tire rotation, but I’ve been busy and the car hasn’t needed anything. I plan to take it in in September. I hope Chevy is as thorough as M-B re: filters, wipers, etc. Frankly, as a longtime journalist, I’ve had a new car to drive every week for 26 years and now that I have my own car to care for, I am being negligent! Thanks again.